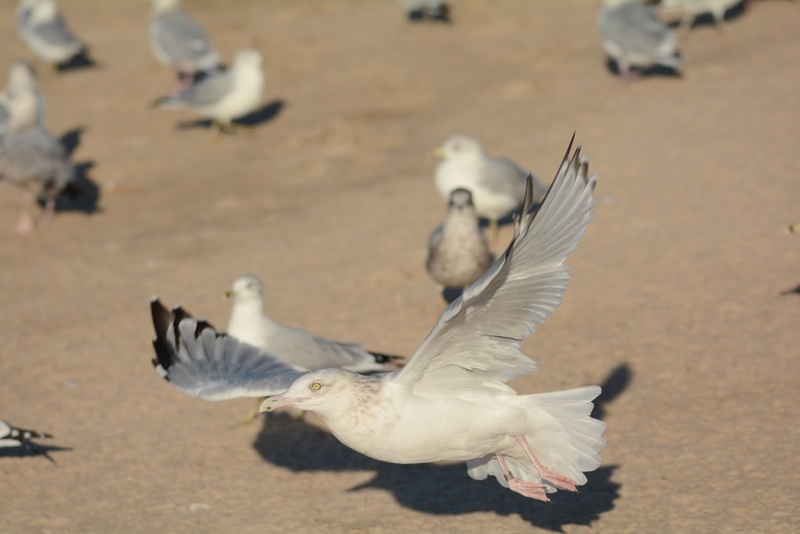 Northern gulls continue to trickle in on southern Lake Michigan with continued sightings of Lesser Black-backeds and Thayer's Gulls in the second half of October. Lesser Black-backed (4th cycle type). New Buffalo, Michigan. 25 October 2014. P1-P8 are 4th Basic. Renewal of secondaries far from complete. Thayer's Gull (juvenile). New Buffalo, Michigan. 25 October 2014. 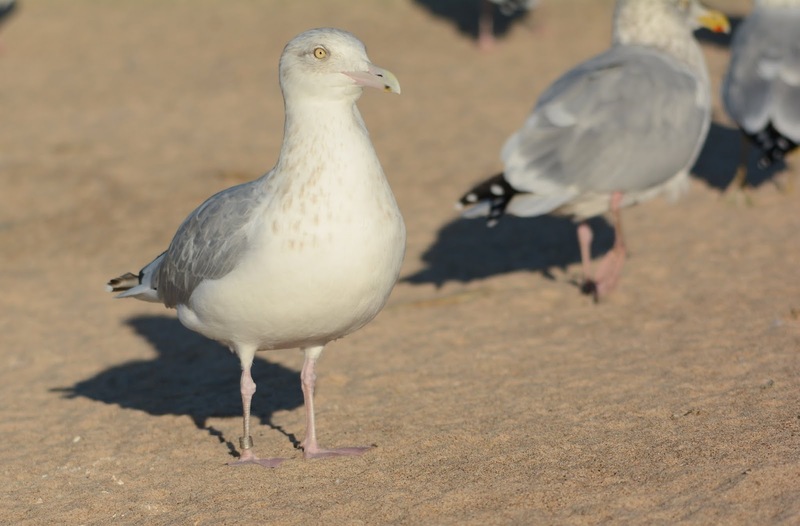 American Herring Gull (adult). New Buffalo, Michigan. 25 October 2014. Band #1106-15613. 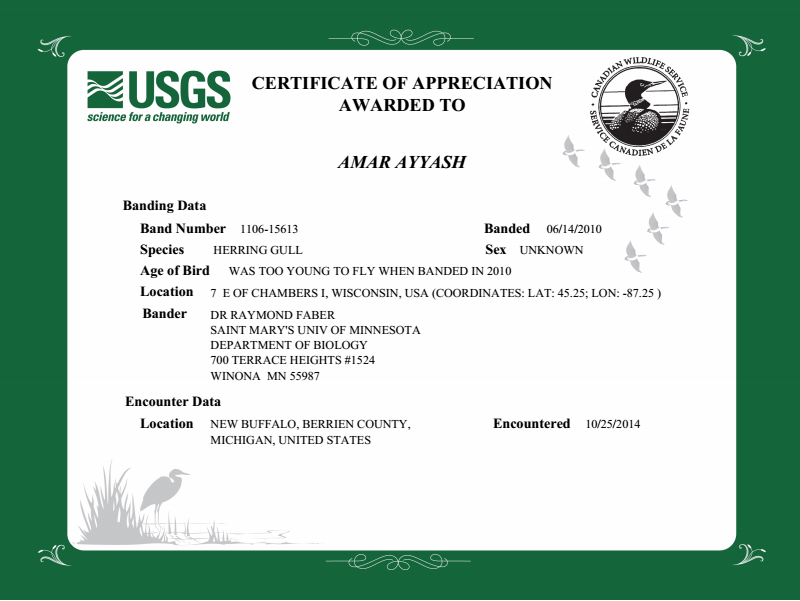 It was banded as a chick while too young to fly (14 June 2010) on Chamber Island in Wisconsin. 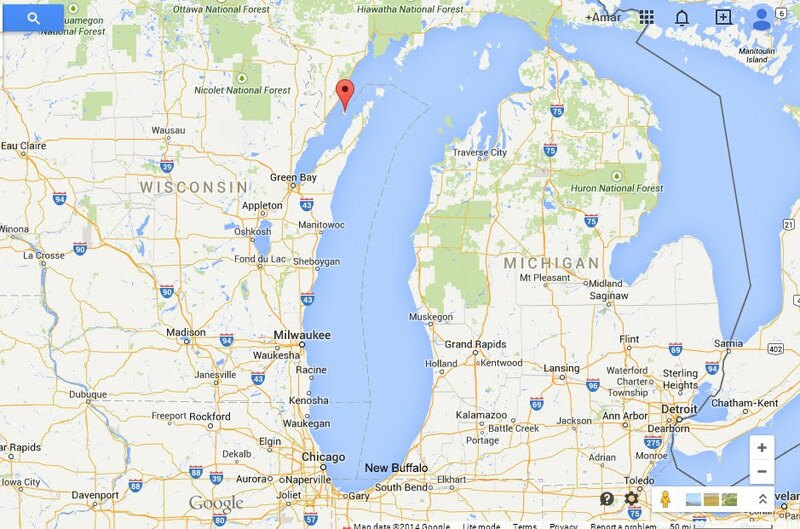 The red pin is Chamber Island in far north Green Bay, Wisconsin (just a rock's throw from Michigan waters along the south-central border of the UP). There's no doubt in my mind that many of the Herrings that breed on the small islands in Door County, Wisconsin, migrate south to New Buffalo, Michigan. Bill deeply tinged with pink. Is this a reliable mark that suggests a "young" adult Herring? Do older adults show this? P9 two-thirds grown (no mirror). P10 one-third grown (relatively small mirror). Note the "fake" mirror at the base of P9. 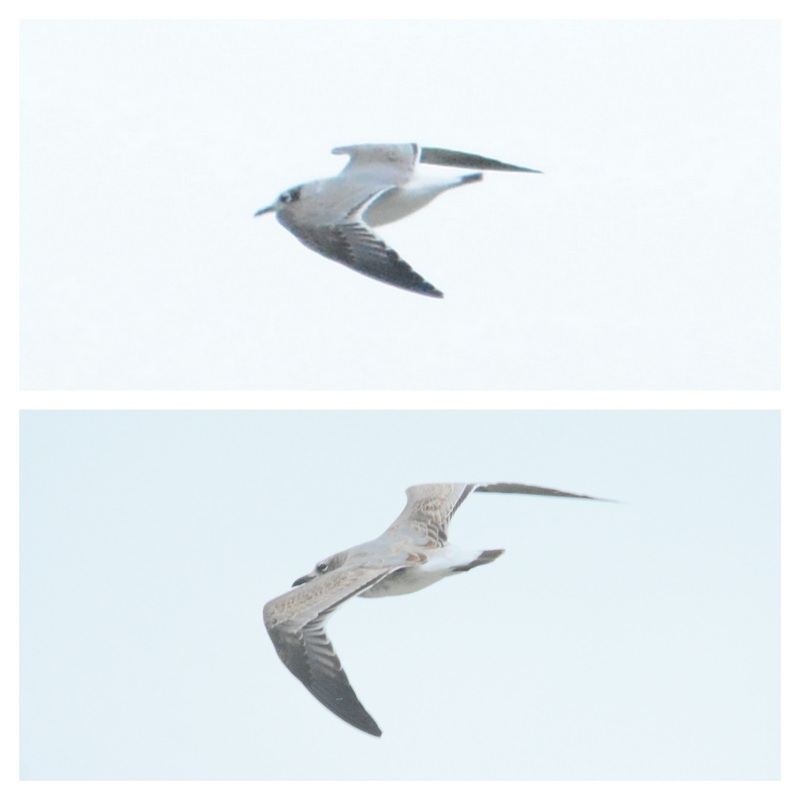 No sub-adult markings on primary coverts, alula or tail. P5 with full subterminal band. Banded Herring (left). 4th cycle type LBBG and adult type Herring (right). P5-P7 with insignificant white tongue tips. Of course the lighting on the water was harsh. This was the best upperwing shot I could manage. 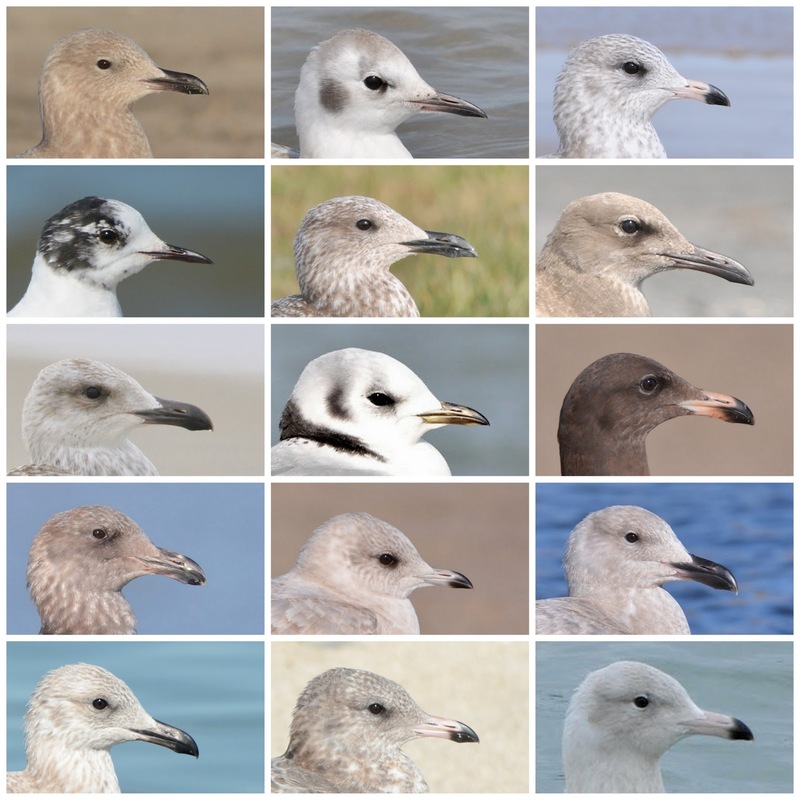 This one probably won't be as popular as the adult version, but here's another collage of 15 species. All are in their 1st plumage cycles. All occur in North America. I'm looking forward to your comments. Enjoy! 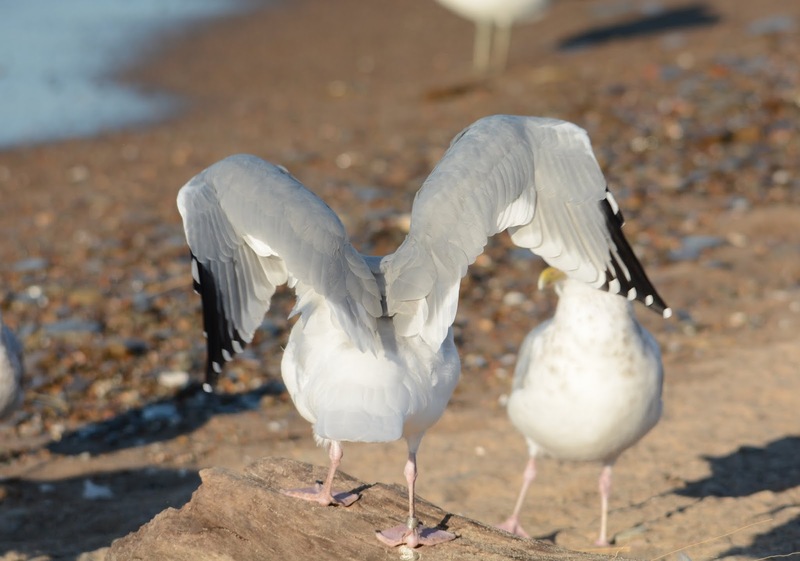 Herring Gull (1st cycle). New Buffalo, MI. 12 Oct 2014. Aside from the petite bill (which might not be done growing) and crisp upperwing coverts, the tertials have a striking pattern to them. The visible pale notches along the tips and ribbed-effect along the tertial edges is not found in the majority of individuals. The primary tips show small pale tips (not uncommon in HY Herrings) which contrast nicely with the entire bird. Can you count the tertials on the right side? This individual is rather worn and bleached for mid-October, but the condition of its plumage is not uncommon for many of the HERGs that are thought to have hatched locally in the Great Lakes region. The former Herring above might be suspected of hatching later in the season at a more northern latitude, but one can't be entirely sure. under the hot Texas sunlight on a warm afternoon. Monterey County, CA. March 1909. "...looks just like a March Western. The small size is probably a preparation thing. My impression is that ALL the juvenile scaps have been replaced, as expected. Western's preformative molt is so early that the feathers come in quite young-looking". Given that it was collected in Central California in March is another reason to believe it's indeed a Western. "Be careful about relying on bill and tarsii measurements on any Taxidermy mount (unless an cast artificial head is used) especially very old skins whether full mounted or drawer skins. These dried skins can dry and shrivel so varied that it would be impossible to gauge the extent or the shrinkage and distortion, and for that matter, color fading. Even plumage coloration fading and handling wear can be completely different than the actual color values. I have been a Taxidermist since 1974 and have seen s o much variation in fading and distorted bare parts, actually this info is almost useless in relation to reality." "Amar, the colors can do just about anything as the bill dries. I have seen a few lighten up, but mostly they get darker and often turn blotchy and uneven." "A skin that is that old will be subject to quite a bit of degradation through time, especially if they are not cared for properly. Markings can change also when the feather texture degrades giving a false optic as to the actual shapes and forms of the markings. Evaluating study skins can be challenging with all these factors taken into consideration. The best approach I have found is to compare a drawer skin to an actual photograph and make your conclusion that way." "When a skin is prepared for a drawer skin, how the "inside" of the skull is handled will also change the shape of the skull and bill. The concept behind drawer skins is to prepare the skin so it can be examined, referenced and researched for time." It's becoming clearer to me that size measurements and bare part colors from old skins - perpared decades ago - are to be carefully considered, especially if no in-field experience is tied to these values. This makes the measurements taken from live birds (such as those found on gullresearch.org) much more meaningful. I wonder what implications this has on measurements found in the literature, specifically our gull guides. The faded hood feathers are interesting - this might be a consequence of long-term feather deterioration exhibited by old skins, or a result of this bird's leucism. Notice the complete fading of the bill color! This is a clear example of a dark bare-part color becoming light, just as a light bare part color may become darker when housed over a long period of time. There are lots of other interesting skins that I saw during this visit and I'll eventually get around to posting all or most of them with comments, but for now, I'll finish with a set of four folded wingtips, from darkest to lightest. Care to guess what species these are? The answers are posted below. 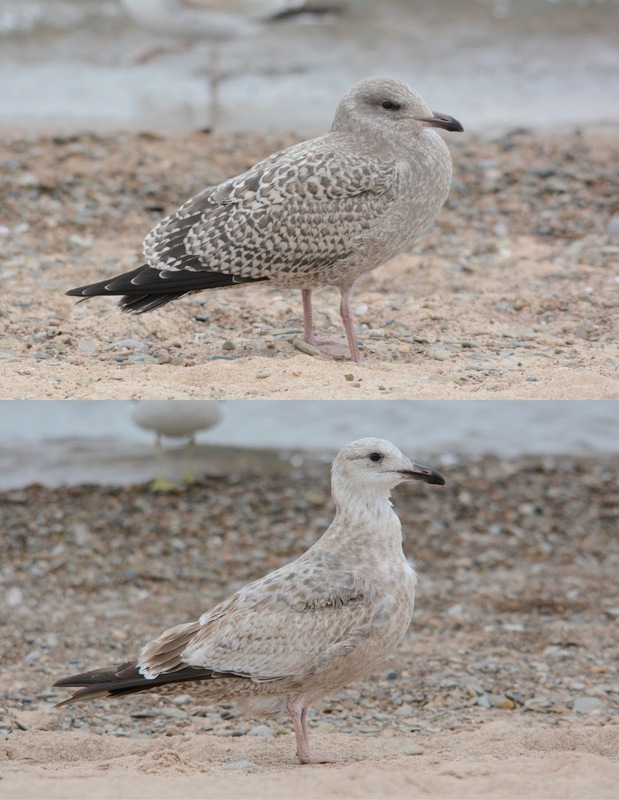 The two on the left were identified as Thayer's Gulls (Alaska and British Columbia) and the two on the right as Iceland Gulls (Nova Scotia). The third bird was actually collected by Earl Godfrey. 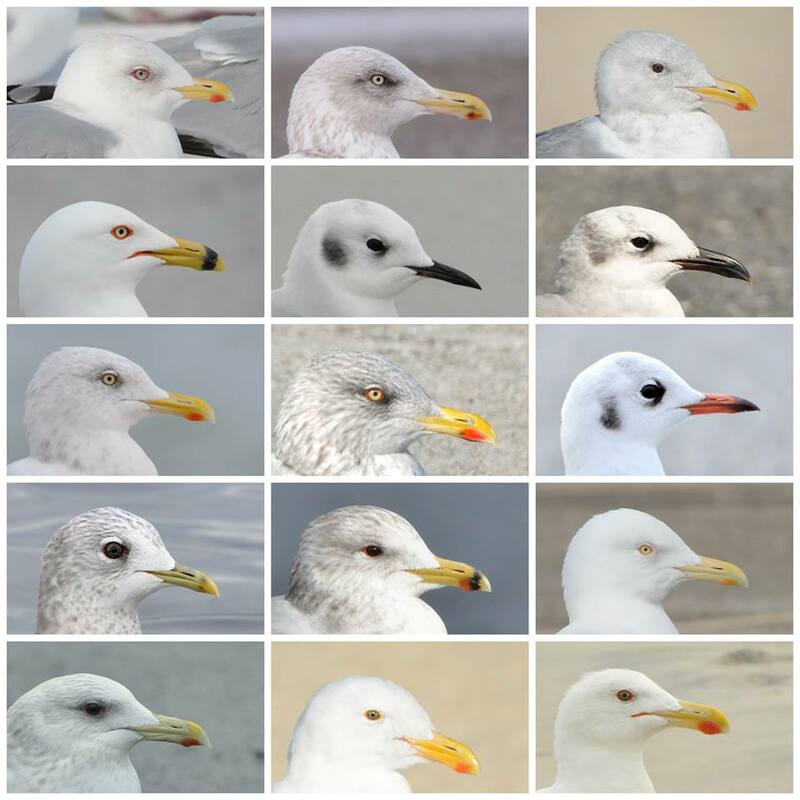 I put this collage together, just for fun, knowing all of my gull-inclined readers would get a kick out of it. The identities are intentionally left off, so feel free to give it a go and see if you can identify these individuals. They're all adults and they all occur in North America. Looking forward to your comments!